What Regular Car Would Make A Great Food Truck? Food trucks bring us a delicious variety of comestibles to the convenience of the sidewalk. Hell, is there anything they can't do? A lot, actually, since they're usually built on clapped-out old cargo haulers. 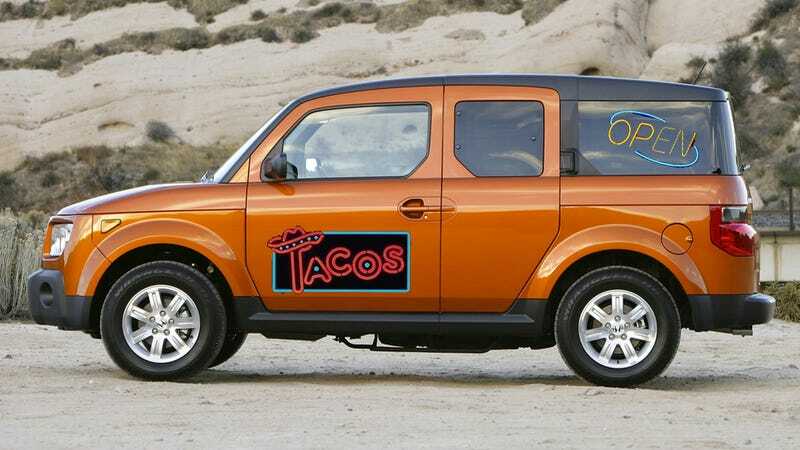 What "regular" cars would make great or hilarious rolling restaurants? I'm a fan of the Honda Element for this application. The interior's easy to clean and the footprint is small for easy wedging into prime vending real estate. Plus, you could use the scraps of "off-road" ability the little SUV has to drive down stairs and go where no other food rig has gone before. Tell us what car you could see serving grub, extra points for Photoshop'ing your suggestion!